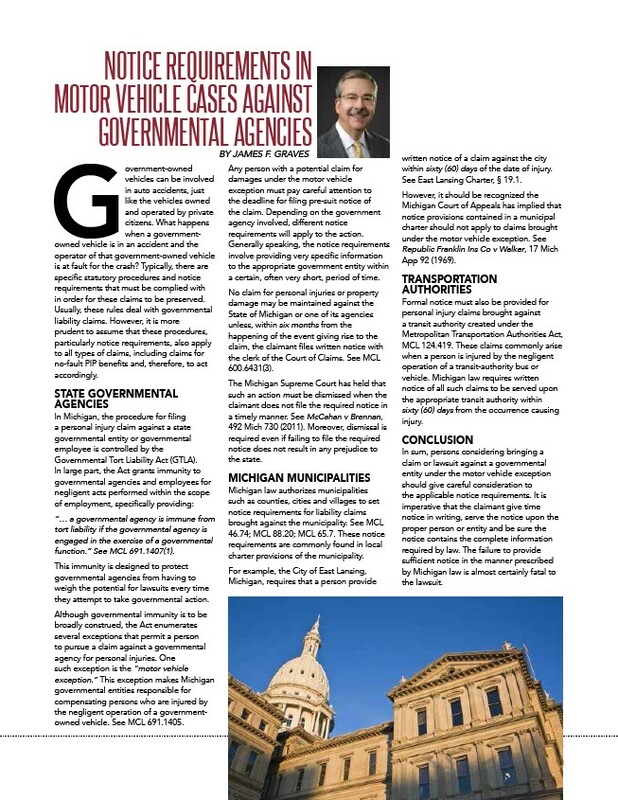 27 InnovativeHealthMag.com NOTICE REQUIREMENTS IN MOTOR VEHICLE CASES AGAINST GOVERNMENTAL AGENCIES Government-owned vehicles can be involved in auto accidents, just like the vehicles owned and operated by private citizens. What happens when a governmentowned vehicle is in an accident and the operator of that government-owned vehicle is at fault for the crash? Typically, there are specific statutory procedures and notice requirements that must be complied with in order for these claims to be preserved. Usually, these rules deal with governmental liability claims. However, it is more prudent to assume that these procedures, particularly notice requirements, also apply to all types of claims, including claims for no-fault PIP benefits and, therefore, to act accordingly. STATE GOVERNMENTAL AGENCIES In Michigan, the procedure for filing a personal injury claim against a state governmental entity or governmental employee is controlled by the Governmental Tort Liability Act (GTLA). In large part, the Act grants immunity to governmental agencies and employees for negligent acts performed within the scope of employment, specifically providing: “… a governmental agency is immune from tort liability if the governmental agency is engaged in the exercise of a governmental function.” See MCL 691.1407(1). This immunity is designed to protect governmental agencies from having to weigh the potential for lawsuits every time they attempt to take governmental action. Although governmental immunity is to be broadly construed, the Act enumerates several exceptions that permit a person to pursue a claim against a governmental agency for personal injuries. One such exception is the “motor vehicle exception.” This exception makes Michigan governmental entities responsible for compensating persons who are injured by the negligent operation of a governmentowned vehicle. See MCL 691.1405. BY JAMES F. GRAVES Any person with a potential claim for damages under the motor vehicle exception must pay careful attention to the deadline for filing pre-suit notice of the claim. Depending on the government agency involved, different notice requirements will apply to the action. Generally speaking, the notice requirements involve providing very specific information to the appropriate government entity within a certain, often very short, period of time. No claim for personal injuries or property damage may be maintained against the State of Michigan or one of its agencies unless, within six months from the happening of the event giving rise to the claim, the claimant files written notice with the clerk of the Court of Claims. See MCL 600.6431(3). The Michigan Supreme Court has held that such an action must be dismissed when the claimant does not file the required notice in a timely manner. See McCahan v Brennan, 492 Mich 730 (2011). Moreover, dismissal is required even if failing to file the required notice does not result in any prejudice to the state. MICHIGAN MUNICIPALITIES Michigan law authorizes municipalities such as counties, cities and villages to set notice requirements for liability claims brought against the municipality. See MCL 46.74; MCL 88.20; MCL 65.7. These notice requirements are commonly found in local charter provisions of the municipality. For example, the City of East Lansing, Michigan, requires that a person provide written notice of a claim against the city within sixty (60) days of the date of injury. See East Lansing Charter, § 19.1. However, it should be recognized the Michigan Court of Appeals has implied that notice provisions contained in a municipal charter should not apply to claims brought under the motor vehicle exception. See Republic Franklin Ins Co v Walker, 17 Mich App 92 (1969). TRANSPORTATION AUTHORITIES Formal notice must also be provided for personal injury claims brought against a transit authority created under the Metropolitan Transportation Authorities Act, MCL 124.419. These claims commonly arise when a person is injured by the negligent operation of a transit-authority bus or vehicle. Michigan law requires written notice of all such claims to be served upon the appropriate transit authority within sixty (60) days from the occurrence causing injury. CONCLUSION In sum, persons considering bringing a claim or lawsuit against a governmental entity under the motor vehicle exception should give careful consideration to the applicable notice requirements. It is imperative that the claimant give time notice in writing, serve the notice upon the proper person or entity and be sure the notice contains the complete information required by law. The failure to provide sufficient notice in the manner prescribed by Michigan law is almost certainly fatal to the lawsuit.